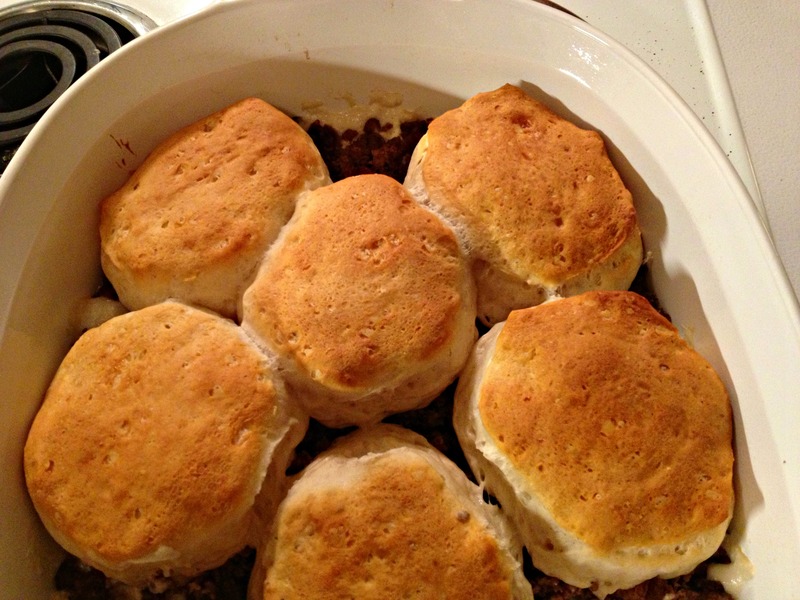 I found this recipe via an online booklet I received called Frugal Recipes: 26 Easy Ground Beef Casserole Recipes. You can get a copy of this free ebook by clicking here. This is the first time I’ve made a recipe from this booklet. You can view this particular recipe by clicking here. Brown ground beef in skillet; drain. Mix cream cheese, soup and corn in a seperate bowl. Pour into two quart casserole dish. Add beef. Top with biscuits. Bake at 350 degrees F for about 20 minutes. I originally picked this recipe because I thought it’d be something quick and easy that my husband could pull together on a night when I was working late or had other plans. He likes “manly meals” and this sounded like one to me. At first, my husband liked this dish. After a while, whoever, he changed his mind and told me he hated it and to never ever make it again. Want to know what caused the flip? It was the biscuits. You see, after cooking them for 20 minutes, the ones towards the outside of the pan were cooked, but the parts towards the middle weren’t. You couldn’t tell from looking at the top of the dish… everything looked uniform. But underneath, the biscuits were still raw. He took one bite of raw biscuit and gagged. That was it for him. Sadly, I’m not entirely certain how to fix this problem except for one way… take your biscuits, smush them together and then roll them out so that they resemble a piecrust. Then top the casserole dish with your biscuit pie crust. You can view all of the recipes I’ve posted by clicking here.